Cerberus | Learn about Greek Mythology,Greek gods,Greek mythology stories! 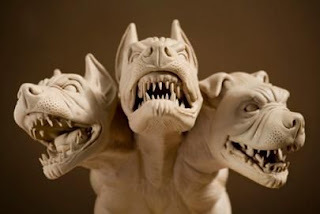 In Greek mythology, Cerberus represents the watchdog of Hades and usually its most common form is a dog with three heads and a tail that ended in an dragon head. In Hesiod refers Cerberus as wild dog of Hades, with sonorous voice and 50 heads, while Homer is aware of what the dog is but not the name. According to Aeschylus, born from the union of two monsters, the giant Typhon and Echidna and was the brother of the Orthrum (similar mythical wild dog) and the Hydra. Its presence ensures the eve of the dead to the underworld but also the inability of the living one, to enter it. Ancient authors often describe Cerberus differently. There are versions which represent it as an ordinary dog, but legged lion tail reptile or snake around his body. In the labors of Hercules: This is the twelfth labor, during which Hercules, using only the strength of his arms, captured and carried Cerberus to Eurystheus, who, however, from fear sent him back to Hades. In Roman mythology and the myth of the hero Aeneas. In Dante's Divine Comedy, the third circle of Hell (ode f). 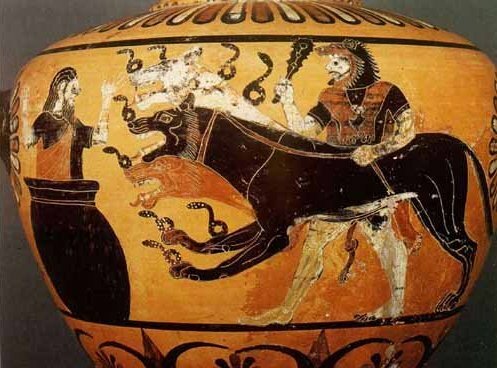 Also apart from Hercules,people who attempted to capture and abduct Cerberus were the Pirithous and Theseus but they failed. Only Orpheus succeeded using the sounds of his magical lyre,tamed him so he was able to take Eurydice from Hades.